This bulletin includes information, instructions and regulations for the competitors. This information is as accurate as possible, but details can still be modified at later stage by the organizers if needed. International Rogaining Federations rules will be followed in general, with some exceptions mentioned in this document. 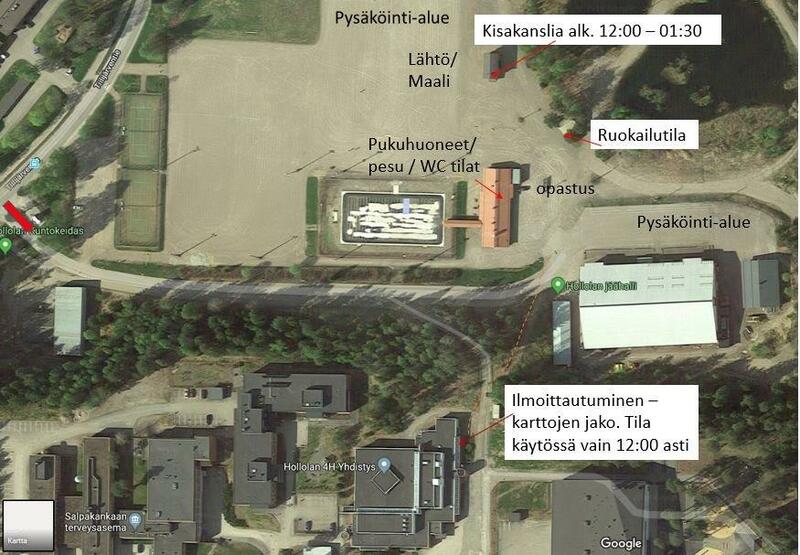 The Hash House locate in Hollola ice hockey ring. A map and additional information will be published on the event website -2019. Please note that you should always remove your shoes (especially spiked ones!) if moving inside the hash house. There will be an area reserved for the tents of the competitors. This area will be quite close to the parking area, but camping next to your car is not allowed. Camping on the forest next to gravel field. The teams shall register at competition centre once they arrive in the morning. In the registration the entry fees will be checked, and you will be receiving the competition material. This will include last minute information, map collection ticket, possible rental emit cards etc. written Control descriptions are visible in competition centre. Teams are responsible for all material given to them. There’s a 68€ fee if a rental EMIT-card is lost. 11:40 Start pit closed, emit cards cleared. 17.05 finish closes 5hMTB event. The map is a topographic map in scale 1:25 000 and has contour intervals of 5 metres. The map is printed on A2+ paper. Teams receive one map per member with a A2+ plastic cover. The cover is open at one end, so the teams should prepare with a clear tape to close it. Some newer paths and roads are not marked on the map. Stones etc. minor details are generally not marked in the map, even if clearly visible in the terrain. On the other hand, all roads or trails that are on the map are not necessarily visible in the terrain. Also the marking of open bedrock, open cuts etc. can be (and often is) outdated. Closer to control point Open cuts are updated. In general the appearance of the map corresponds well with the scale. Keep the scale in mind when considering crossing over ditches or swamps. Restricted areas include Private yard and fields. Crossing these areas means disqualification. To prevent disturbing local people and to allow us organizing competitions in the future, competitors shall not enter into any private yards or fields. These have not been marked as restricted area–but, all fields must be considered forbidden. This goes also for houses and yards which are not shown on the map. Crossing fields will mean disqualification. allowed is to use fields border ditch. There are 43 controls in the area. Teams may visit the controls in any order they like. More terrain data with photos and map samples will be provided on the event website. The controls are marked with an orange-white flag and a small reflector. There is also a EMIT-unit at each control. There is a sample control at start area. The controls are numbered from 22 to 105. The first digits indicate “tens of points”: e.g. control 24 gives 20 points, 57 gives 50 points, 105 gives 100 points etc. Control descriptions will be distributed with the maps in a separate document. water point are shown on the map or pointed in the control descriptions. EMIT timing system is used in the competition. Emit card(s) must be cleared before start. Team must punch card at each of the controls they wish to gain points. Teams are allowed to carry a spare emit with them. They are also allowed to punch this spare card also at every control. Only if the first one with the registered emit number is lost or malfunctions, the spare one can be presented to the organizers. In every case the results are always based on the score from one and only one card. Teams are responsible for clearing the Emit-card at start area before the start. If the card is not cleare, the team will not have a result. There’s a clearing point at the entrance to the start pit. At the finish teams must punch at the finish control immediately (your finishing time is the time of this last punch) and then proceed to result service for reading of the emit-card. All team members must stay within 20 meters from each other during the whole race. This is monitored during the event in the terrain. Competitors are not allowed to rest within 100 meters from controls unless the control is a water point. Competitors are not allowed to spoil or damage controls, refreshment controls or any other structures built by organizer. MTB class competitors do Not need to carry bike all the way to the controls, but can leave bike side of the road/trail close to the control point. There are controls suitable specially for MTB. Everyone can select what control they like to collect. One point next to shop (sale, open until20), one point next to ST1 station, open late. And one at the end of road next to control 82. Carry some money if want to purchase something. Start and finish are both located at the competition centre just outside the hash house. All teams have to be inside the start pit ten minutes before the start when the pit is closed. For missing the Finish time line, a team gains 10 penalty points for each starting minute. Teams finishing more than 15 minutes late will end with zero points. For their own safety each team must carry a mobile phone in a waterproof container and a first aid kit. The kit must include at least: emergency blanket, first aid gauze (pack or two rolls), plaster and sports tape. Each competitor must have a whistle, a water container, some food and a cap, spare undershirt and a windproof jacket. This kit need to be with competitor whole competition time. Each team will get one number that needs to be visible during competition. Own safety pins needed. During the competition each team is allowed to have GPS equipment which track the route, But NOT visually help the navigation. During the competition competitors can eat and drink for free at the hash house after start. There will be juice and water served, the food will include at least soup and bread + small snacks like raisins etc. Meal served inside. Competitors are advised to bring with them both to the terrain and to the hash house sports drinks and nutrition which they are used to use during this kind of events. Each team must have a first aid kid mentioned under obligatory equipment . At the competition office there will be first aid equipment for sudden injuries. If your team faces am emergency during the competition, you must notify the organizers of the event immediately for further assistance or evacuation from the course, if it is needed. If the emergency is life threatening, you must call 112, the european emergency number. If it is a smaller injury and you only need evacuation back to the hash house, please call the organizers at +358 50 3801511. This number will be monitored during the whole competition. Please register this number on the mobile phone that you carry with you during the race. Number visible on the map. The competitors have not been insured by the organizers, please make sure your own insurance covers regaining/orienteering competitions. You may call the same number +358 50 3801511 also if a checkpoint has been vandalized, there is no water at a water point or you come across another technical problem along the course. There are toilets at the competition center. There are basic washing possibilities after the race. showers inside hash house, note that shoes are not permitted inside. There will be soup served for at least one hour after the competition is over. After that no food is served in the hash house. Prizes will be awarded according to the timetable competition centre area. In Main classes (12h, 6h, 5hMTB and 3h) the three best teams will be awarded. To receive a prize you have to be present in person to collect the prize – prizes will not be delivered afterwards.